Ride your Fat Tire Bikes in Whitaker Woods! The Mt. Washington Valley Ski Touring & Snowshoe Center is the first Nordic network in our area to allow Fat Bike riders to use network trails. All riders must display a daily trail pass or season pass. 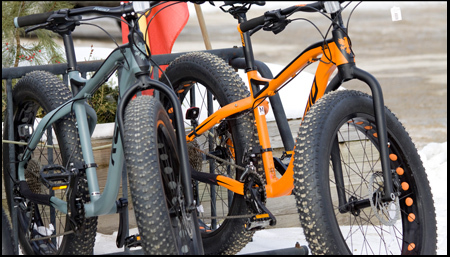 Fat Tire Bikes are allowed to use ungroomed trails and the designated bike trail in Whitaker Woods anytime. Riders may also use other groomed trails within Whitaker Woods when conditions permit. Please refer to our Daily Snow Report for trail conditions. Riders are not allowed on network trails outside of Whitaker Woods. A bicycle with over-sized tires typically from 3.7" to 5" wide with rims twice as wide as a standard mountain bike tire is their distinctive difference. These bikes turn mountains into molehills by making the most challenging and technical terrrain much easier to ride. Tire pressure can run as low as 5psi on soft terrain like snow and sand compared to a standard mountain bike pressure of 20-30psi. This low pressure provides great traction and flotation over soft terrain plus the extra air provides some suspension. Your ride is less rigid and more comfortable whether you are riding on snow in winter or rolling over roots, rocks and logs the rest of the year. A Fat Bike is also very stable and forgiving allowing new riders an opportunity to explore off the beaten path with confidence. Two intown bike shops located within a short ride of the trails offer daily rentals for $30. Access is dependent on trail conditions -- check daily snow report. Snow Bikes Only! Tires wider than 3.7" and pressure less than 10psi. Bikes yield to ALL other users. Stay on the right of the trail, off tracks and please give skaters wide berth. Stay off trails with more than 3" of new snow. If you leave a rut deeper than 1", having trouble with straight line riding, or pushing your bike ... please STOP riding. Stay on trails designated for fat tire biking. Please be a good trail citizen. If the conditions cause you to leave ruts that will impact future health of the trail system, leave the trail. Don't just keep riding because you can. Spread the word about snow biking. The success of a partnership between a Nordic network and Fat Bike Riders depends on educating all users and keeping bikes off the trails when snow conditions are soft or marginal. Stay polite, educate other bikers, discourage bad behavior. Follow the rules and have a great time biking.